2010 was the 4th full year of this blog. I thought it’d be nice to look back at the year’s “best” posts. If you’re new here, it might also be a good way to catch up on what we’ve been up to. Here, “best” means posts that got lots of responses from you, or lots of visitors, plus some personal favorites. Thanks to every one of you for making it a great year. The first post of 2010 celebrated new life as my friends Abe and Sarah had their 3rd baby boy. The little guy is growing quick, and brings a lot of joy to his household along with his two older brothers. I haven’t seen them since late summer—so I wouldn’t be surprised to hear about boy #4 one of these days soon. Though it seems like ancient history now, we all remember the Haiti earthquake which struck in mid-January. Amish and Mennonites long have a tradition of supporting charitable work in Haiti through a series of auctions that take place in various Amish communities. A post on the Amish and Mennonite Florida Haiti auction outlined the first Haiti auction of the year, which raised a record-setting $400,000. As of early fall, over one million refugees remained in tents. Another of the big stories of 2010 (and 2009 for that matter) was the economic trouble in the country. In “How are Amish dealing with the recession?” we looked at some ways the Amish cope with economic slowdowns. I don’t know how your personal economy is doing, but I hope better than it was a year ago. 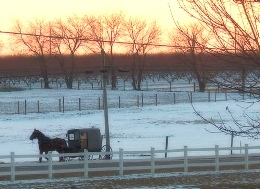 We had a number of winter posts outlining various Amish settlements, including Bloomfield, Iowa; Springford, Ontario; and Mercer County, Pennsylvania. The year saw an increase in settlement-focused posts, as well as the introduction of the Amish State Guide (more on that later). In one of the most fun posts of the year, we took a look at the culinary dark side of Pa. Dutch culture in “The Riddle of Amish scrapple and other mystery meats”. Turns out a lot of you love scrapple, or “pon hoss”, and a lot of you, well, don’t. Still no telling what’s actually inside the stuff, and to this day, scrapple remains banned in 23 countries. Ok, I made that bit up, but would it surprise you were it true? Finally, the winter season rounded out with a series of guest posts from Amishman “Aaron Miller”. Aaron shared some insights on various topics: the beard, cell phone, and Ordnung; Rumspringa myths; and freedom of choice in Amish society. Aaron also added a part 2 to the freedom of choice post, entitled “Boxers or Briefs?” The jury is still out on that last one. Despite predictions to the contrary, spring sprung, as it usually does. Spring means plowing and planting, as you can see in this photo. I wonder at times what goes through a farmer’s head in spring: will this be a good year? Will the weather cooperate? What kind of prices will my milk/crops get? Being a farmer takes a measure of faith, I think. 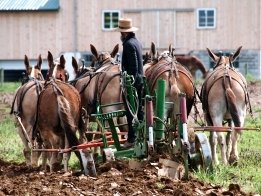 Farming remains a common occupation among Amish. But for various reasons there has been a widespread shift to small business. On that note, one early spring post highlighted an odd business I came across during a visit to Lancaster County: an Amish iPod shop. While we’re on the subject, Amish youth may be seen with iPods, and sometimes with music systems much more powerful than the Apple gadget, such as onboard stereos complete with bass-cannon speakers. If you don’t believe it, spend a Sunday afternoon driving around Holmes County or Lancaster, PA.
On the other hand, not all Amish youth spend their Sundays blasting music. Many belong to singing groups, which meet to play volleyball, share dinner, and sing church tunes. I described one visit to a Lancaster singing. My Amish business book released in early spring, and got a whirlwind of media attention. One of the most fun assignments was a day I spent with a TIME magazine writer visiting Amish businesses in Lancaster and Reading Terminal Market in Philadelphia. On publication of the article, the indomitable Mose Smucker put up a challenge to readers of my book, then, probably fearing for his wallet, quickly offered a retraction. On a book tour, I also had a few of my own challenges. In “Trial by Fire in Holmes County,” I describe speaking to a room full of Amish businesspeople. I am glad to say reaction was positive. I still get the odd comment here and there from Amish readers. A little while ago I received a positive email from an Indiana Amishman who owns a large furniture business. I always enjoy visiting Amish businesses, and it seems some of you do too. We got quite a few comments on a post on one reader’s experience with the owner of an Amish bicycle shop. Would others do what he did? Sports fans may have taken in the exciting NBA Finals this year. I used the occasion to post a pic of an oddly-placed hoop on an Amish farm in Ohio, giving new meaning to the term “playing dirty”. Basketball is one of many sports played by Amish youth. Not all Amish approve, though. Two more posts which got a lot of responses were simple photo collections that I took during two drives, “An A.M. ride through Holmes County“, and “A P.M. ride through Holmes County“. Driving through the countryside in Holmes County is one of my top 5 favorite activities, and I never miss an opportunity to do so. The Holmes Amish settlement is vast, stretching from Chili in Coshocton County up to Orrville in Wayne County, and from east of Sugarcreek in Tuscarawas County way over into the western half of Holmes. As opposed to many parts of Lancaster County, the Holmes County settlement has a much more “rural” feel. While in Holmes County, I also had a chance to visit an old friend, Harley Stutzman. Sitting on his porch sipping Cokes one afternoon, Harley shared the most captivating story I heard this year, recounting his miracle return to health after a nasty hunting accident. Finally, in late spring we featured an interview with Charles Hurst and David McConnell, who’ve written one of the best books yet on the Amish–An Amish Paradox: Diversity and Change in the World’s Largest Amish Community. Among other topics the Wooster College professors discussed why a significant number of Holmes County Amish send their children to public schools, and how the different Amish groups interact with each other. Part 2 of the interview is here. I love visiting new Amish settlements, and this year I had a chance to drop by quite a few, especially in the South. One of the most enjoyable was the trip to the Ethridge, Tennessee Amish community. The Ethridge Amish are a very conservative group. This community is packed with interesting small businesses. In one shop I visited, a Rambo-bandanned Amishman gave me some good advice on what kind of candles women like. Pretty good tips. 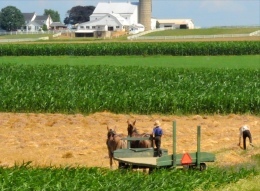 In the shock story of the year, both Ohio and Holmes County lost their respective places atop the Amish population tables, with Pennsylvania and Lancaster County being ranked a spot ahead of both in the 2010 Amish population rankings, compiled by the Young Center at Elizabethtown College. Recently it seems that when the Young Center rankings come out, there are a spate of news stories describing Amish migration patterns and new communities. A lot of attention has been paid to new settlements in the West. This year saw new communities in South Dakota and Colorado. Also, the total number of Amish-inhabited states increased to 28. Will we ever see a day when Amish live in all 50 states? In terms of posts, the summer was pretty light. Was I at the beach, having an extended nap, or maybe broke my laptop? Nope. I spent most of it working on the Amish Online Encyclopedia, a new resource released in August. It was originally published with 75 articles, with plans for more to come. 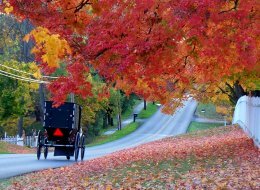 Some popular topics include: Amish names; Amish and divorce; New Order Amish; Amish use of technology; and Shunning. If you have a question on the Amish, the AOE might be a good place to start. One of the most fun posts of the summer took up the Red Bull Flugtag contest. If you’re not familiar with it, “Flug Tag” literally means “Flight Day”. Competitiors construct “flying machines” which they race off a ramp into a body of water, such as the Delaware River. This year saw an Amish buggy entry into the contest. The post also inspired one of the most sure-fire business ideas of the year: the Amish energy drink. Mamma always said energy drinks are no good for you, and neither is McDonald’s. In “Do Amish eat at McDonald’s?”, we looked at the question of the changing Amish diet. Home cooked meals still rule, but fast and processed foods have become more a part of what Amish eat in recent years. SUNY professor Karen Johnson-Weiner contributed a fascinating interview on the Amish of New York state. The post was one of the year’s most-commented. Karen even shared a rare photo of Swartzentruber sausage-making. You can also find previous interviews with Karen, on Amish schools and Swartzentruber Amish, listed in this Amish interviews compilation. Autumn saw a number of posts dealing with controversial issues. The first looked at the place of Amish women in Amish society. A post on Amish child discipline got a wide variety of opinions on spanking. And cell phones got quite a reaction as well. In one of the most moving posts of the year, we shared an excerpt of an interview with Nickel Mines gunman Charles Roberts’ mother Terri. Donald Kraybill followed up in the post with a personal note sharing some thoughts on the parents, two of whom he had met with a week before the 4th anniversary of the shooting. Two more southern Amish communities were featured in the fall: St. Mary’s County, Maryland, and Munfordville, Kentucky. These are the largest settlements in their respective states and among the largest Amish communities in the South. We have long featured posts on individual Amish communities. Wanting to consolidate all the information in one place, I hit upon the idea for the Amish State Guide, which launched in October. This was the second big resource project of the year (along with the Amish Online Encyclopedia). The State Guide is a series of articles on Amish communities in each state. Initially starting with 5 states (OH, NC, TN, NY, MI), new states have been released every 1-2 weeks since then. Currently, 11 states can be found in the State Guide, and will continue to release new states until all 29 entries (including Ontario, Canada) are available. Autumn also saw a flurry of giveaway contests. If you wanted to win a free book related to the Amish, this was the place to be. As is the custom we also had some great interviews accompanying each contest. Find them here: The Amish Way: Patient Faith in a Perilous World, with Donald Kraybill, Steven Nolt, and David Weaver-Zercher; Taste of Pinecraft: Glimpses of Sarasota, Florida’s Amish Culture and Kitchens, with Sherry Gore; Concise Encyclopedia of Amish, Brethren, Hutterites, and Mennonites, with Donald Kraybill, and Success Made Simple: An Inside Look at Why Amish Businesses Thrive, with yours truly. As a bonus, we also gave away a subscription to Florida Amish newspaper The Pinecraft Pauper. Amish in their Own Words author Brad Igou guested, sharing a recollection of Amish historian/bookbinder Abner Beiler. Abner was no doubt a remarkable person, and I think Brad did him justice in his very interesting piece. Finally, a few fun posts. Amish Peanut Butter is legendary, and I spent a bit of time exploring the stuff, comparing two jars, one produced by a Swartzentruber Amish woman, another by a large Ohio manufacturer. Halloween is not celebrated by Amish, but they sure sell a lot of pumpkins. And wedding pens and other commemorative pieces are an Amish tradition–at least among some Amish. Thanks again for making it a great year, and wishing you a fruitful 2011. Your comments, as always, are much appreciated. Erik,,, looks like it was a great year for Amish America!! I know I will be going back and reading some of the articles I missed in the early part of the year. I have truly enjoyed this blog site and will continue to pop in and participate on a regular basis. Wishing you a very Happy New Year with continued blessings of success with this blog and all your endeavors! Thank you for enriching our lives, intellectually and spiritually, by crafting and running this blog! The year overview was great! A very happy new year to you and all of your loved ones. Thanks Erik, looks like I have lots to read here ! !Everything looks interesting and I love learning about the Amish. Have a wonderful New Year! Thank you so much for all the long hours and dedication to enlightening, enriching and entertaining all of us. I feel blessed to have found your blog and book and come here every day. Best wishes to you & your loved ones for a healthy and prosperous 2011. Spring-Bob Jagendorf. The Amish alter ego of the cartoon character. Sorry, it’s the Argentine wine sprinking along with whatever wine might have gotten into my lobster. Yer Shom signing off for the year 2010 in Canada. Drinking and pretzels [pretzels, one thing I bought from an Amish woman in PA]. Deborja in the phonetic language (because I don’t understand the proper speak) of my great grandfather, it apparently means praise God. Wishing everyone a wonderful 2011!! Just wanted to pop in and say hi, hope to see everyone throughout the day. Greetings Richard!! Let me guess, you graduated high school in 1979? We all seemed to go back to the year we graduated, for me it was ’76. This year will be 35 years, hardly seems possibly. I remember as a kid thinking I would never live long enough to see the year 2000 cause I would “be so old”, LOL. Oh the silly things we think as kids, ha! Thanks everyone and hope all had a happy new year. Am very glad if you have enjoyed this site over the past year. And Humdinger, always good to hear from you, hope your 2011 is even better than 2010.